Mark Wells was born on the 14th February 1892, in Rotherhithe, London. He was the third eldest of 7 children of Louisa, and his father, Mark Wells, a police sergeant in the Metropolitan Police. By 1895 the family had moved to Hackney, where Mark attended Church Street School. Mark, after leaving school, took up employment as a footman at Stoke Place, Stoke Poges, Buckinghamshire, the country estate of the HowardVyse family. 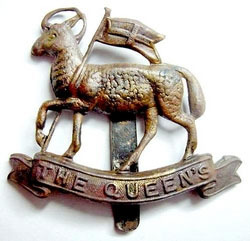 Enlisting during WW1 at Watford, probably as one of “Kitcheners Volunteers”, he joined the 6th Battalion Queens (Royal West Surrey) Regiment, service number T/265942. 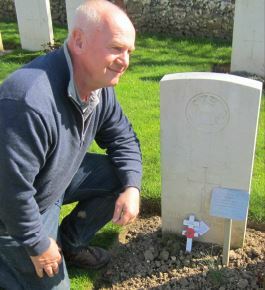 He was one of 2 men of the battalion killed on the 27th August 1918, when the battalion was engaged in the Battle of Amiens, pushing from Meaulte towards Mametz. He was originally buried in a small cemetery near where he fell, before being moved to his final resting place in Quarry Cemetery, Montauban, France. 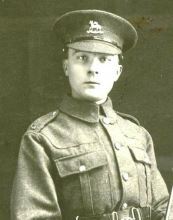 There is no evidence that he ever lived in Thame, his parents having moved to Thame during the war and had his name placed on Thame War Memorial, and St Mary’s Church Memorial Board.